Fitness trackers and heart-rate monitors are all well and good, but if you want to track activity inside the body, the solutions aren’t nearly as convenient. Iota Biosciences wants to change that with millimeter-wide sensors that can live more or less permanently in your body and transmit wirelessly what they detect, and a $15 million Series A should put them well on their way. 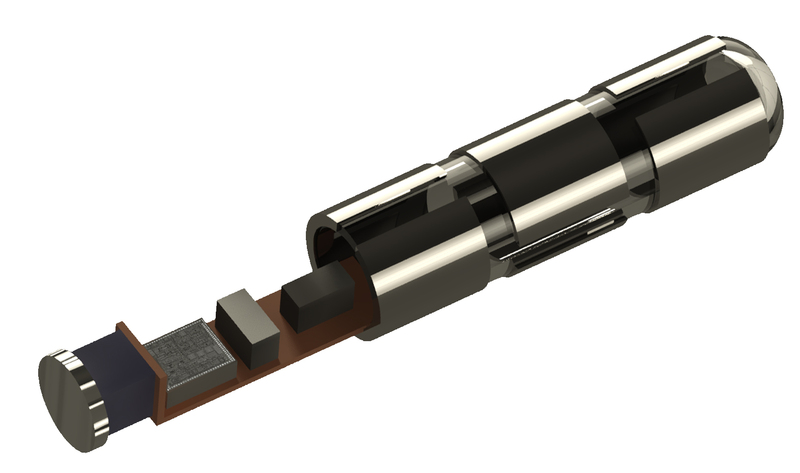 The team emerged from research at UC Berkeley, where co-founders Jose Carmena and Michel Maharbiz were working on improving the state of microelectrodes. These devices are used all over medical and experimental science to monitor and stimulate nerves and muscle tissues. For instance, a microelectrode array in the brain might be able to help detect early signs of a seizure, and around the heart one could precisely test the rhythms of cardiac tissues. 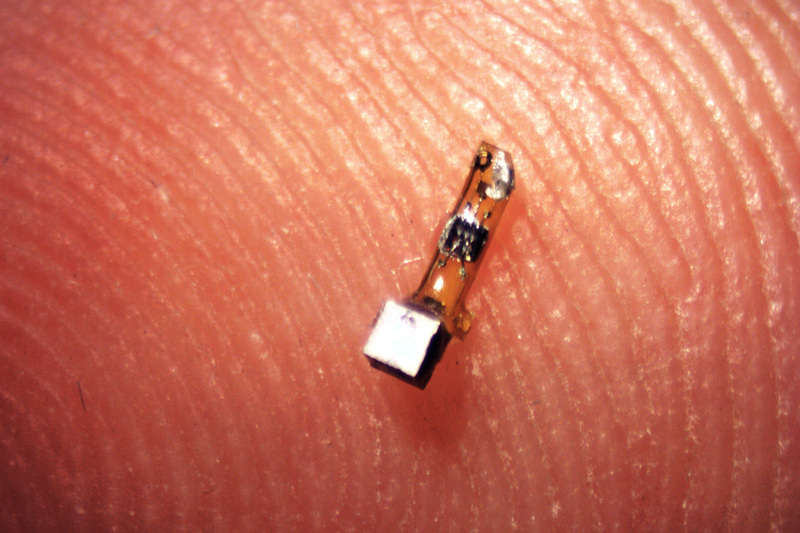 But despite their name, microelectrodes aren’t really small. The tips, sure, but they’re often connected to larger machines, or battery-powered packs, and they can rarely stay in the body for more than a few weeks or months due to various complications associated with them. Considering how far we’ve come in other sectors when it comes to miniaturization, manufacturing techniques and power efficiency, Carmena and Maharbiz thought, why don’t we have something better? “The idea at first was to have free-floating motes in the brain with RF [radio frequency] powering them,” Carmena said. But they ran into a fundamental problem: RF radiation, because of its long wavelength, requires rather a large antenna to receive them. Much larger than was practical for devices meant to swim in the bloodstream. You’re probably familiar with ultrasound as a diagnostic tool, for imaging inside the body during pregnancy and the like — or possibly as a range-finding tool that “pings” nearby objects. There’s been a lot of focus on the venerable technology recently as technologists have found new applications for it. Iota’s approach, however, has little to do with these traditional uses of the technology. Remember the principle that you have to have an antenna that’s a reasonable fraction of an emission’s wavelength in order to capture it? Well, ultrasound has a wavelength measured in microns — millionths of a meter. So it can be captured — and captured very efficiently. That means an ultrasound antenna can easily catch enough waves to power a connected device. Not only that, but as you might guess from its use in imaging, ultrasound goes right through us. Lots of radiation, including RF, gets absorbed by the charged, salty water that makes up much of the human body. The device they put together to take advantage of this is remarkably simple, and incredibly tiny. On one side is what’s called a piezoelectric crystal, something that transforms force — in this case, ultrasound — into electricity. In the middle is a tiny chip, and around the edge runs a set of electrodes. It’s so small that it can be attached to a single nerve or muscle fiber. When the device is activated by a beam of ultrasound, voltage runs between the electrodes, and this minute current is affected by the electrical activity of the tissue. These slight changes are literally reflected in how the ultrasonic pulses bounce back, and the reader can derive electrophysiological voltage from those changes. Contained inside non-reactive, implant-safe containers, these microscopic “motes” could be installed singly or by the dozen, doing everything from monitoring heart tissue to controlling a prosthesis. And because they can also deliver a voltage, they could conceivably be used for therapeutic purposes, as well. And to be clear, those purposes won’t be inside the brain. Although there’s no particular reason this tech wouldn’t work in the central nervous system, it would have to be smaller and testing would be much more complicated. The initial applications will all be in the peripheral nervous system. At any rate, before any of that happens, they have to be approved by the FDA. As you might guess, this isn’t the kind of thing you can just invent and then start implanting all over the place. Implants, especially electronic ones, must undergo extreme scrutiny before being allowed to be used in even experimental treatment. Fortunately for Iota, their devices have a lot of advantages over, say, a pacemaker with a radio-based data connection and five-year battery. The only transmission involved is ultrasound, for one thing, and there are decades of studies showing the safety of using it. And unlike a major device like a medication port, pump, stint, pacemaker or even a long-term electrode, “installation” is straightforward and easily reversible. It would be done laparoscopically, or through a tiny incision. said Carmena. “If it has to be taken out, it can be taken out, but it’s so minimally invasive and small and safe that we keep it,” he said. These are all marks in Iota’s favor, but testing can’t be rushed. Although the groundwork for their devices was laid in 2013, the team has taken a great deal of time to advance the science to the point where it can be taken out of the lab to begin with. The A round should get the company from its current prototype phase to a point, perhaps some 18 months distant, when they have a production-ready version ready to present to the FDA — at which point more funding will probably be required to get through the subsequent years of testing. But that’s the game in medtech, and all the investors know it. This could be a hugely disruptive technology in a number of fields, although at first the devices need to be approved for a single medical purpose (one Iota has decided on but can’t disclose yet). It’s a long road, all right, but at the end of it is the fulfillment of a promise straight out of sci-fi. It may be years before you have microscopic, ultrasound-powered doodads swimming around inside you, but that future is well on its way.